Culinary Specialist 1st Class (SW/MST) Matthew Susienka plates the salmon and lobster in a warm butter sauce (Staff photos by Jacqueline Klimas). Culinary Specialist 1st Class (SW/MST) Matthew Susienka, an enlisted aide at U.S. Fleet Forces Command, was cooking up something delicious Monday for attendees of the Navy League’s annual Sea-Air-Space symposium outside Washington, D.C., at the Naval Supply Systems Command booth. Susienka cooked a trial run for his certification exam for executive chef, coming up on Saturday. 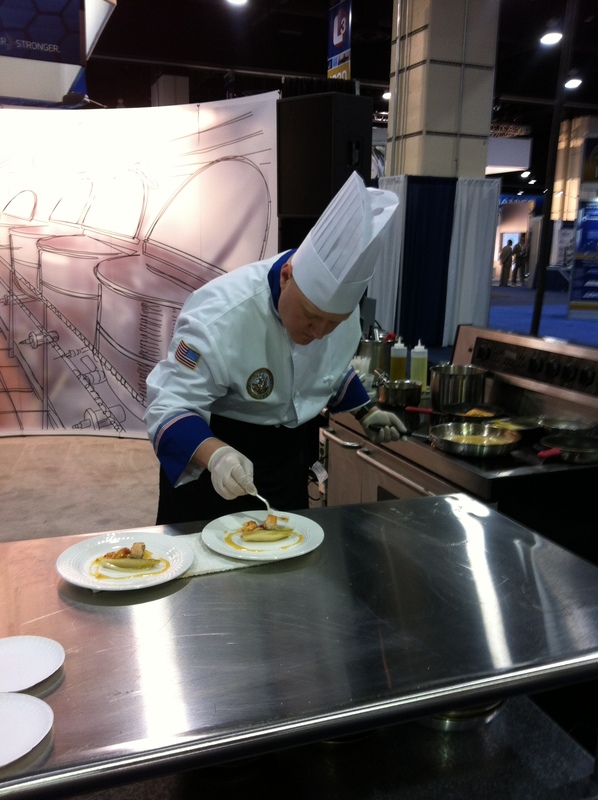 His exam piece, which he made at the conference, is pan-seared salmon with poached lobster in a warm butter sauce. He also made a spinach and bibb lettuce salad with candied pecans and poached apple, and an artichoke fritter with a bacon vinaigrette. 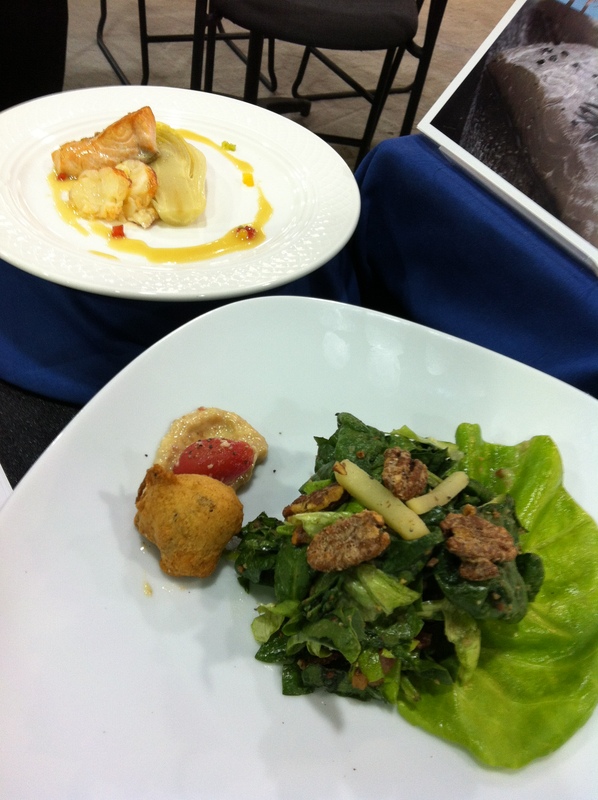 Salad and main course on display Monday at the Sea-Air-Space NAVSUP booth. He chose the dish because he had to use the two ingredients mandated by the test: salmon and lobster. A salad course was also required for the exam. Being certified as an executive chef will help Susienka’s chances for advancement, he said. Susienka said he likes being a Navy chef because he’s able to raise the standards of cooking across the fleet and teach junior chefs a skill that will be marketable in life after the Navy. If you’re at the Sea-Air-Space event, cooking demonstrations are going on at the NAVSUP booth today through Wednesday at 9 and 10:30 a.m., noon, and 1:30 and 3 p.m. A different chef will be cooking at each presentation and samples will be available.